Getting your organizations name and mission out to the public can be a challenge for any nonprofit. But before you go out and start a major outreach campaign, make sure you have a solid platform to build from. Here are five basic tools to help you make a winning first impression. All these will also help you build capacity. You can implement these in any order. Having an email address from hotmail, yahoo, aol or even gmail just looks unprofessional. Yet, many people have email addresses that are [email protected] But it is pretty easy to do it right. In order to have a custom email, you need to have a domain name. Yes, domains are for websites, but you don’t need a website to own a domain name. So, find a domain name that is as close to, or exactly, the name of your organization. Be sure to get a “.org” url. These are typically for nonprofits. It should cost about $10 – $20. I use HostGator*. It cost $15/yr to register a domain with them. Learn more about HostGator. Creating your new email is easy. It only takes 30 seconds. If you can’t figure out how to do this, just call Host Gator support (or whoever you use), they will walk you through it. Create emails using your domain name that are position specific. For example [email protected], [email protected] Putting a name in your email (e.g. [email protected]) is OK, but when Sarah leaves then the email address becomes useless. Remember: you do not need a website to have your email match your domain. You just need the domain. In fact, some people buy domains just so they can have a custom email address. General Manager – MyNonprofit Inc.
Set up your email client to automatically add your signature to your emails. A business card is an expectation your organization should meet. Handing someone a business card at the end of a meeting adds a touch of professionalism to the final moments of that meeting. Fumbling around for a scrap piece of paper to write down your phone number does not. Plus a business card helps you build capacity. It makes getting your information into the hands of others quicker and more efficient. You can also add your tagline and Facebook page URL (or other social media link). You can get 250 full-color business cards for $20 at VistaPrint. They also have some good templates to start you off with. If you write letters then you should have a letterhead. If you have a logo and know the font(s) used in it, then making a letter head should be pretty simple. Just set up a “header” in a word document and put your logo image in it. 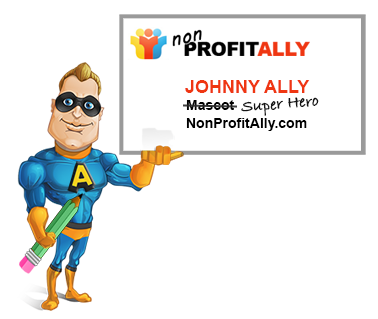 Then add your nonprofit name, tag line, address, phone number and website URL next to it. Now take the document and save it as “letter head” in your office docs folder (see “Get Organized” for file folder organization tips). Alignment matters. When in doubt, do NOT align everything center at the top of the page. Center aligned content can make the eye jump in zigzags. Just justify it to the left and align it with the rest of the content in the letter. Use the same logo, fonts and colors as your website and business card. Ideally you want the same vanity name for all your social media profiles. But this is not always possible. If you can’t get the exact name for each profile then do your best to make them similar by using underscores, hyphens, prefixes, etc. Twitter is a bit of an exception because your Twitter name also counts toward the 140 character limit per tweet. So, if you have a long name for your nonprofit, it may be best to abbreviate your Twitter username. Lock in every profile you can get. You never know when a Twitter guru may join your board. Give a consistent brand experience across all social media accounts by using the same color scheme, logo, fonts and backgrounds on your profile pages. The sooner you can get these tools in place, the sooner you will be giving a professional first impression to everyone you meet. These foundation building tips also go a long way toward building capacity. How? Well, it is simple. If someone has a question about your organization, they can find it on your website. If someone wants your phone number, you can hand then a business card. If someone wants to respond to your letter, they can find your information in the letterhead or signature. By making it easier for people to access information about your organization, it becomes easier for you to accomplish your mission. Finally, here are some tips on how to implement the above tools into your organization. Prioritize. What tool is going to help you the most? Which is going to be easiest to accomplish first? Create a time line. Many of these tools can be accomplished in less than a week. Though, your logo will probably need to go through an approval process and it will take time to develop your website content. In any case, all of this can be accomplished in a 4-6 week period. Delegate task to board members. Roll out implementation. Just because your website is not ready does not mean you can’t start handing out business cards. Think of all this as the platform from which you are building your mission. Just get the right tools in place an start building. Remember: every contact you make is an opportunity to create a positive impression about your organization. *Throughout this article I make suggestions on where to get specific services. I only recommendations what I use and what I truly support. The asterisked references are affiliate links so I do get a small commission. There is no extra cost to you. There are plenty of other quality services to use and if you are uncertain about my recommendations I encourage you to research other options. Thanks.